The lovely name Ivy comes from the English word for the climbing plant with the same name. It ultimately comes from the Old English word ifig. This plant is known for its clinging vines and its small yellow flowers. Ivy actually symbolizes faithfulness and fidelity and was traditionally presented in the form of a wreath to newlyweds in ancient Greece. However, there is of course the association with the "poison ivy" plant that can causes rashes and skin irritations upon contact. Based on the nature of this plant comes the fictional character who uses these toxins for criminal activity. The DC Comics supervillainess, who is aptly named Poison Ivy, has been an enemy of Batman since her creation in 1966. She is essentially an eco-terrorist who is obsessed with botany and uses it to her advantage. Modern little girls named Ivy will either think she is super cool or they will resent the association, so think carefully on this topic before committing to the name Ivy. There are also plenty of other Ivys in pop-culture, though. The most recent one that is probably still on everyone's' minds is that of Beyoncé and Jay Z's daughter Blue Ivy. I read somewhere that they chose Ivy because of the Roman numerals IV which has significance for them as a couple. It is up to you whether you like this celebrity association or would rather avoid the name Ivy because of it. As a baby name and despite the "poison ivy" associations, modern parents are falling in love with this quirky, botanical name. This name contains the coveted letter V which is a huge trend for girl names these days. It is short and sweet with only three letters, but it does have two syllables so it doesn't feel quite as short. Overall, Ivy is a lovely and strong choice. 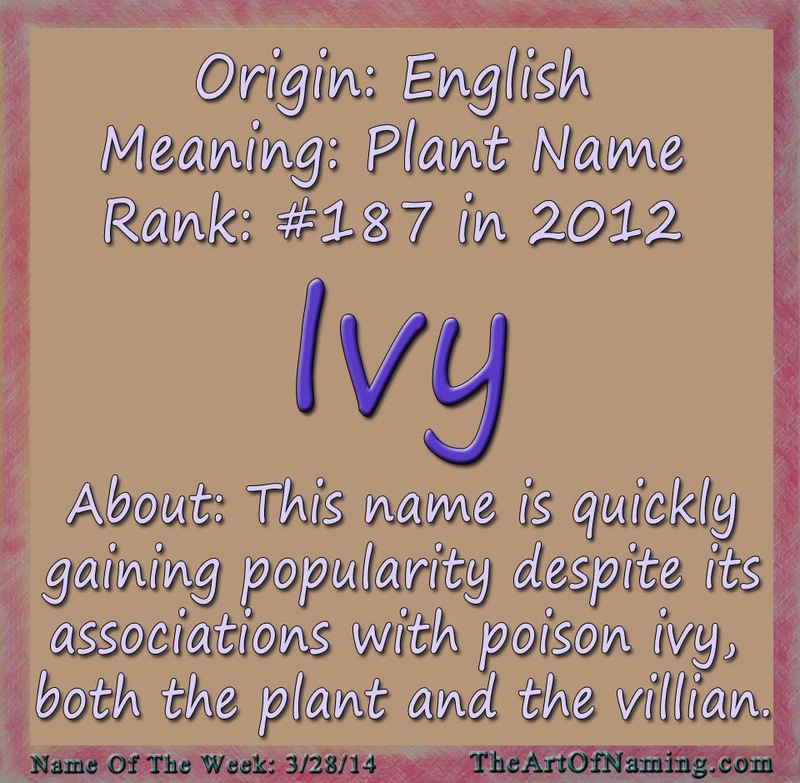 It fits in with the other -v names as well as the other fast-rising botanical and nature names. 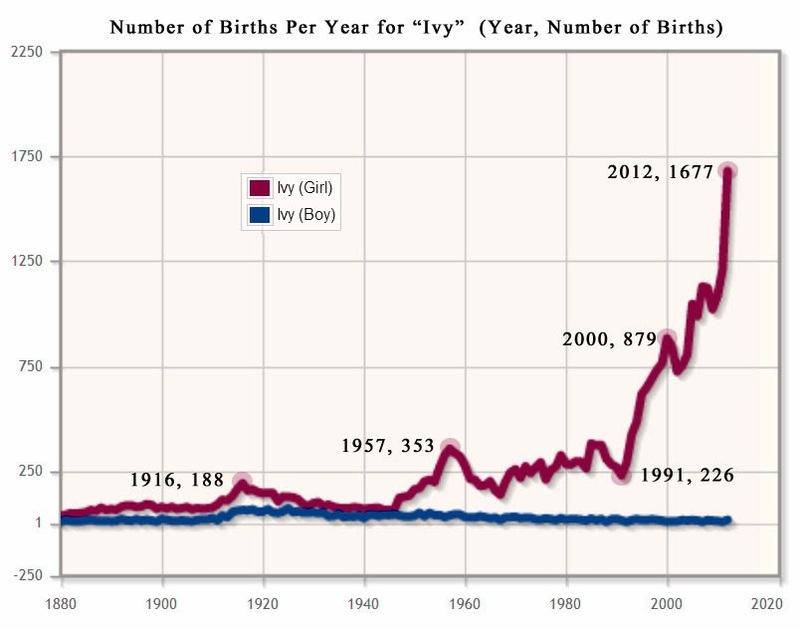 Ivy is more popular now than it ever has been in the US. It has been in regular usage since records were first kept in 1880. Along with many other vintage favorites, Ivy enjoyed a small popularity boost from 1912-1927 or so with the most amount of births being 188 in 1916. It wasn't until the late 1940s and early 1950s that this name gained a more permanent upward tick in popularity. With only a few ups and downs, Ivy has been on an upward trajectory. In 2005, the name passed the 1000-births-per-year mark and is currently sitting happily with 1,677 births for the year 2012. That puts the name at a record-high ranking of #187. This is rather impressive because the name jumped a whopping 80 ranks between 2011 and 2012! 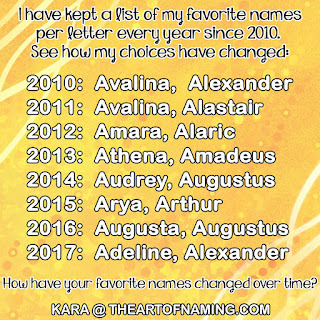 Not very many names will have such a dramatic change from one year to the next. I think this name will only continue to rise in the coming years. This name ranks well in other countries, too! #168 in England/Wales, #153 in the Netherlands, #65 in Canada (BC) and #21 in Australia (NSW). What do you think of the name Ivy? Do you agree that it will continue to gain popularity or will people start to write it off because Beyoncé used it? These are just ideas! What would you pair with Ivy?